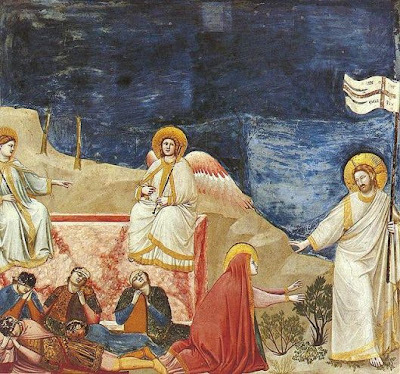 Undoubtedly, the Resurrection of Christ is the most important event in human history. It changes man's relationship with death and releases him from its dynastic power. This changes, or better, renovates his relationship with God, with the surrounding world, with his fellow-man, and even himself. 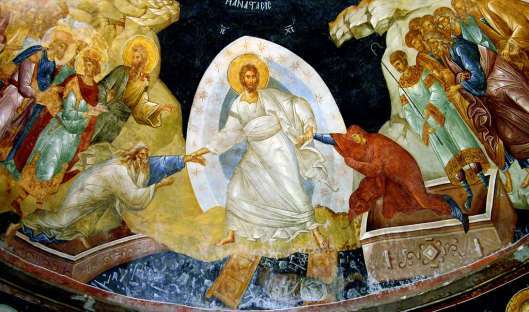 The Orthodox Church had and has the obligation to convey this message of the Resurrection in our world, so that it becomes ours. The methods it used and uses are many: the Mystery of the Divine Eucharist, the hymnography, the didactic lives of the saints, the iconography of the churches. 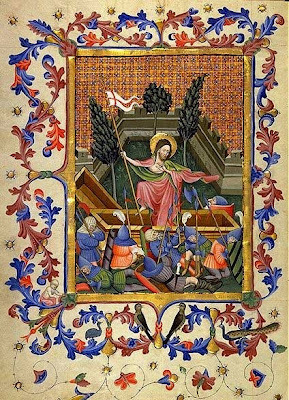 The figure of Christ dominates the center of the composition, Who stands on the crushed gates of Hades holding Adam in His hand and extracting him from Hades. In many cases He holds with power the hand of Eve, raising her from the dead. The central figures surrounding them are John the Forerunner and all the righteous before Christ's time, who believed the preaching of Christ during His descent into Hades (hence the title of the composition) and were saved. 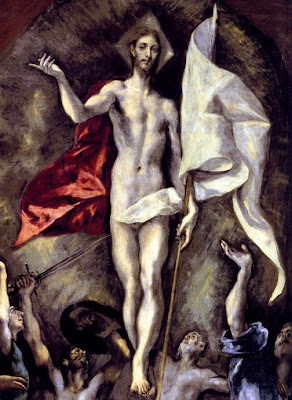 The idea for this composition comes from the passage in 1 Peter 3:18-19: "He was put to death in the body but made alive in the Spirit. After being made alive, He went and made proclamation to the imprisoned spirits." 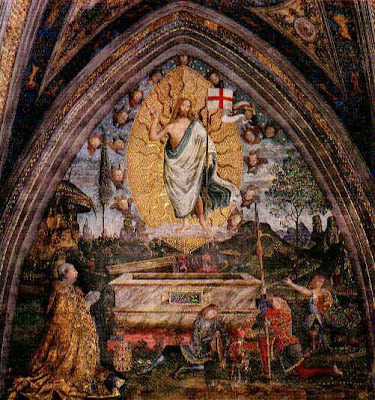 The components are derived from the tradition of the Church, which was recorded in the spurious Gospel of Nicodemus (Constantin von Tischendorf, Evangelia Apocrypha, Leipzig, 1853: pp. 302-311), in which the unknown author records the "details" of what happened in Hades during the descent and stay of the Lord. Apart from the spurious text already mentioned, our hymnography shows complete agreement with this description. 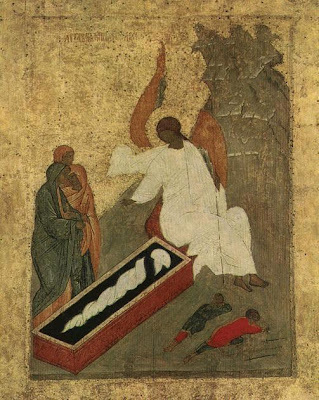 This follows faithfully the Gospel narratives of the Lord's burial and what followed it. The composition is dominated by the empty tomb, the angel and the myrrh-bearers. In some situations it also shows the soldiers asleep. 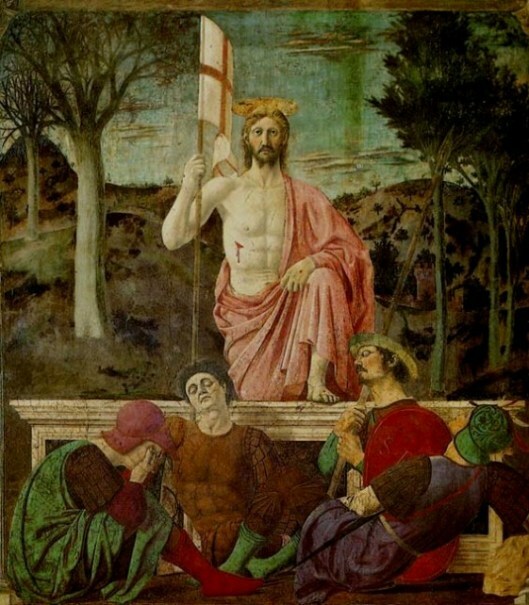 Of western origin, this depicts Christ at the moment of His Resurrection, usually holding a flag (Photios Kontoglou called it a "standard"), while around Him are either surprised or sleeping soldiers. This type seems to have appeared in the medieval west (perhaps after the 11th century) and became best known in the 14th century through Giotto di Bontone (1266-1337). It greatly flourished in the East from the 16th - 19th century with a wide variety of variants, especially in Crete and the Ionian islands, perhaps due to the Venetian rule in them. 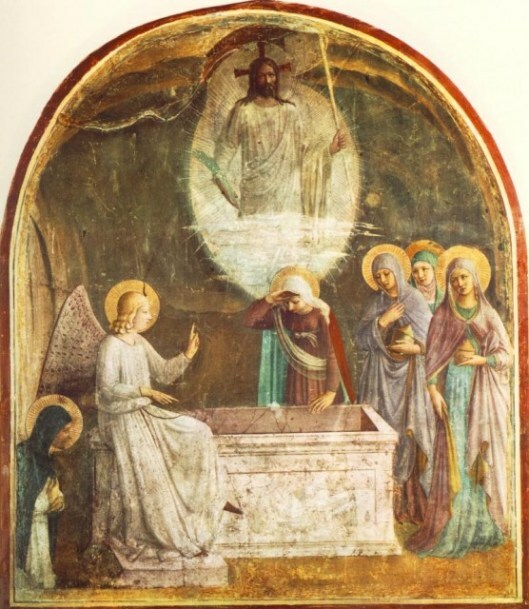 In essence, we observe that the western image tries to depict the moment of the Resurrection and the way the body of the Lord emerged from the tomb, which was not seen by anyone, while the "Descent Into Hades", according to the biblical reference (1 Peter 3:18-19) shows the body of the Lord not to illustrate a moment, but to project the outcome of the event. The result is nothing other than the salvation of Adam. Put simply, the western formula of Christ emerging from the tomb is trying to reconstruct a realistic scene. 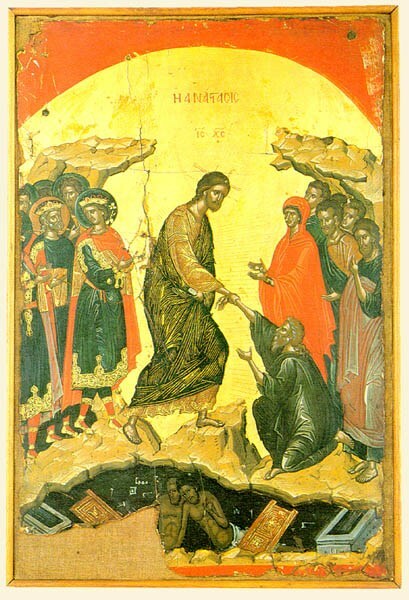 In contrast, the "Descent Into Hades" tries to show the result of the Resurrection in our lives. 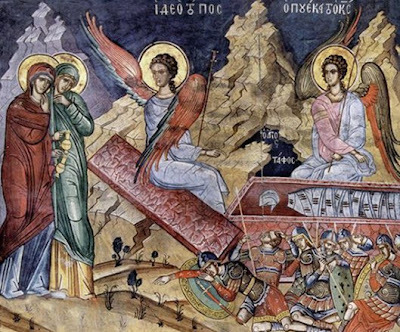 The composition of the "Empty Tomb" is so firmly grounded on the witness of the Gospels that there is no credibility issues or controversy. 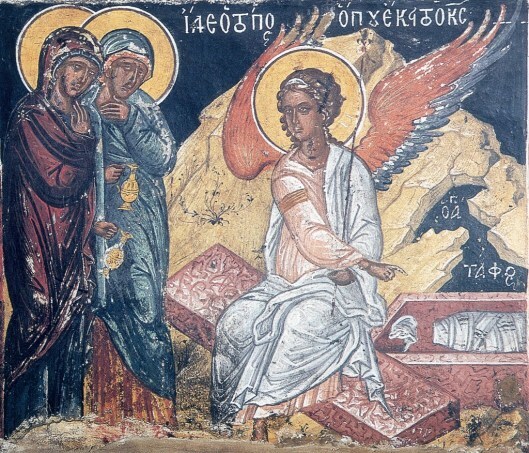 In the composition of the "Empty Tomb" the body of Christ is not shown in Hades. 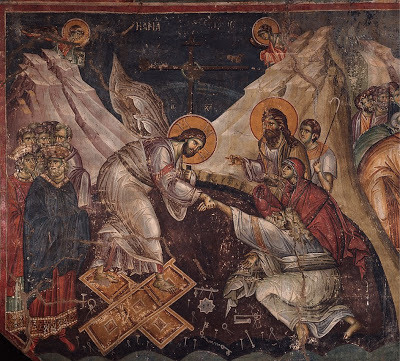 However, we must stress that the bodily representation of Christ, Who "trampled Hades and raised Adam", did not bother St. John of Damascus (PG of J.P. Migne 95.3165A), but instead considered it perfectly normal and acceptable. Indeed, a little below the column 325D of the same volume of the Greek Patrology of J.P. Migne, St. John of Damascus goes into a detailed description of it. The western depiction shows a fantastical realistic scene, avoiding to deal with biblical references. The two Orthodox depictions highlight the beneficial effects of the Resurrection to humanity, and tries to view it in a simple, understandable, symbolic, and deeply theological way. They also have a biblical starting point, fully coinciding with the Gospel witness. Therefore, if we want to avoid the trap of rationalizing the scene and adding fictional elements to it, it is advisable to proceed to the distinction between the two different types of representations of the Resurrection of the Lord.